Excess body weight is a major risk factor for cardiovascular diseases, increasing the risk of hypertension, hyperglycaemia and dyslipidaemia, recognized as the metabolic syndrome. Adipose tissue acts as an endocrine organ by producing various signalling cytokines called adipokines. One of the first characterized adipokines, Adiponectin, is a member of the C1q/TNFrelated protein (CTRP) family and has attracted much interest because of its antiinflammatory and insulin-sensitizing effects. To date, 15 additional CTRP family members have been identified that might also play a role in metabolism and immunity. Several of the CTRPs so far exert insulin-sensitizing effects similar to adiponectin. Therefore, these proteins might compensate for adiponectin deficiency, explaining why adiponectin knockout mice have only mild metabolic disturbances, even when fed a high-fat diet. Due to their homology with adiponectin, they might have important implications in energy homeostasis and might provide novel pharmacological targets in type 2 diabetes (T2D) and obesity-related inflammation and could be new molecular mediators connecting inflammatory and metabolic diseases. CTRP proteins share a common structure composed of four distinct domains: a signal peptide at the N terminus, a short variable region, a collagenous domain and a C-terminal globular domain that is homologous to complement component 1q (C1q) (Figure 1). C1q itself is a component of the classical complement pathway released by the liver, and is crucial for the clearance of pathogens and apoptotic cells. C1q forms trimers composed of A, B and C chains and resembles a bouquet of tulips under electron microscopy (Figure 1). CTRPs principally form highly stable, biologically active homotrimers. However, recent studies suggest that CTRPs may also form heterotrimers. The family of CTRPs is rapidly growing and these proteins are widely expressed in human and murine systems. 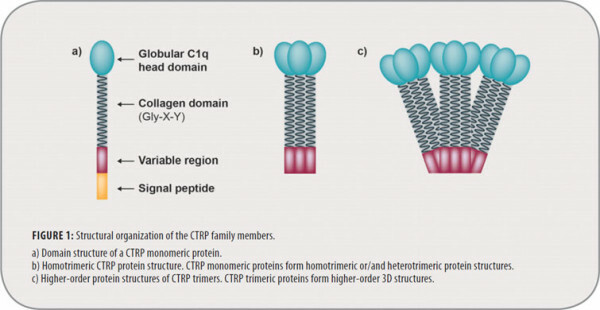 CTRPs are pleiotropic proteins and, similar to adiponectin, have many different physiological functions and are of high clinical interest as drug targets in various diseases. They have highly conserved structural homologies. Diversity, modularity and pleiotropic function are among the most important characteristics of these proteins. Identification of their respective receptors and functional characterization of the low and high MW isoforms will be essential to elucidate the physiological roles of these proteins. Adiponectin [ACRP30; AdipoQ] is the best-characterized member of the CTRP family and is highly if not exclusively produced in adipocytes (white adipose tissue; WAT). It is secreted into the bloodstream as three oligomeric complexes, including trimer, hexamer and high molecular weight (HMW) multimer comprising at least 18 monomers, which possess distinct biological activities. The HMW oligomer is the major active form mediating insulin-sensitizing and cardiovascular protective effects. Adiponectin differs from most adipokines as it is negatively correlated with obesity. Adiponectin exerts multiple biological effects throughout the body mediated by the specific receptors AdipoR1, Adipo- R2 and T-cadherin. AdipoR1 and AdipoR2 interact with the adaptor protein APPL1, which binds the N-terminal intracellular domains of the receptors. The binding of adiponectin to its receptors provokes the activation of AMPK and the activation of various signaling molecules, such as p38 MAPK, PPAR, the RAS-associated protein Rab5, PI3K and Akt. Activation of AMPK mediates pharmacological actions of adiponectin, including fatty acid oxidation, protein degradation, cytoprotection and glucose uptake. Recently, it was shown that the insulin-sensitizing and anti-apoptotic actions of adiponectin are attributed to the stimulation of ceramidase activity and the formation of the anti-apoptotic metabolite sphingosine-1-phosphate (S1P) (Figure 3). The physiological role of adiponectin (see Figure 4) is not fully elucidated, but it is believed that it has the ability to reduce glucose, triglycerides and free fatty acids and that it plays a major role in the pathogenesis of metabolic syndrome. Numerous studies have shown decreased adiponectin bioactivity in obesity and obesity-related complications, including insulin resistance, diabetes, cardiovascular diseases (CVD) and non-alcoholic fatty liver disease (NAFLD). It is a regulator of immune cell activity, cancer cell proliferation, angiogenesis and many other processes. New findings showed urinary adiponectin excretion as an independent new biomarker of microvascular and macrovascular damage in T2DM and suggested it as a very promising tool for early cardiovascular disease risk assessment. It was also shown that adiponectin has antidepressantlike behavioral effects in normal-weight mice and in obese diabetic mice. Adiponectin levels are critical in determining susceptibility to depressive behaviors and therefore adiponectin could be considered as a potential innovative therapeutic target for depression treatment. 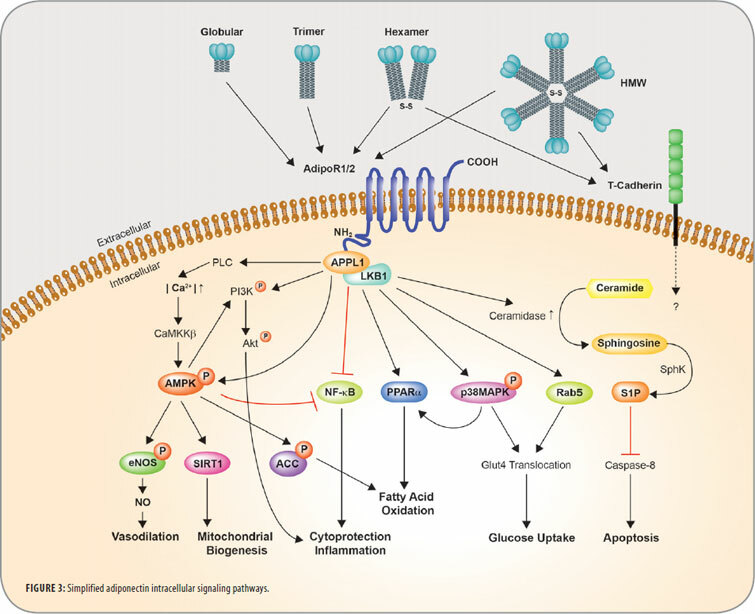 Recently, it was shown that adiponectin effectively induces activation of dendritic cells and the release of proinflammatory cytokines, leading to enhanced Th1 and Th17 responses and demonstrating its importance in inflammatory processes.